BRIGHOUSE Town warmed up for their tough FA Trophy preliminary round tie at Witton Albion on Saturday (3.0) with a 5-0 demolition of Garforth Town in the first round of the West Riding County FA Senior Cup on Tuesday. Manager Paul Quinn played a strong side, despite having to rest ex-Bradford City striker Leon Osborne (hamstring), midfielder Ryan Watson (illness) and striker Jamie Frost (groin). 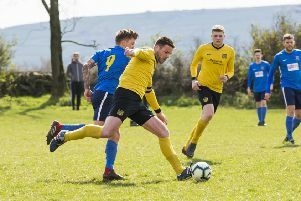 He brought in midfielder James Hurtley, who has been out on loan at AFC Emley after a lengthy suspension, and played James Buchanan at left wing back after his loan with Campion. Garforth, from the NCEL Premier Division, had two early chances through Mitch Hamilton and Mark Simpson but Ed Hall, brought in for rested keeper Tom Taylor, saved well off Simpson and had a fine game throughout, especially with his distribution. It was quick tempo football from Town, and on 15 minutes it nearly paid off for leading scorer Luke Parkin but Dom Smith saved well. However, the breakthrough came on 20 minutes when Parkin, who had had a penalty claim turned down, played a great one-two with Buchanan and buried the ball in the net from 18 yards. Four minutes later Ruben Jerome was taken down coming into the box and he calmly blasted home the spot kick. Three minutes later James Pollard had a strong shot blocked on the right of the box and from the rebound Daniel Bunch sent the ball screaming into the net for 3-0. Pollard left the field shortly afterwards with an ankle injury, to be replaced by Adam Field. For the second half Garforth replaced Smith with former Town custodian Paul Hagreen, who was kept busy. Jerome, booked in the 48th minute, was replaced by Steve Mallory on 56 minutes and the pressure was cranked up from the right. Parkin and Buchanan worked well to lay on a chance for fullback Greg Pearson, who scuffed the ball home from three yards out. A minute later the Halifax-based former Frickley Athletic player showed he can also hit them from distance as his great shot left Hagreen clutching fresh air. Town had further chances in the final 20 minutes and Hall superbly denied the home side a consolation goal in added time. Town have a bye in round two and will then entertain the winners of the Knaresbrough Town v Goole AFC tie on Monday, December 3. Pollard, Watson and Frost will have fitness tests ahead of Saturday’s tie against a side that was watched last Saturday by the manager’s father, Gerry Quinn. With their 2-1 win over Basford, Witton are now third in the Evo-Stik NPL Division One South under manager Carl McCauley. Quinn senior reported that Town have the ability to beat a side with two lively strikers.